If you’re a speculative fiction reader or fan and you haven’t heard of Shawn Speakman, you’ve probably heard of his website: The Signed Page at http://www.signedpage.com/. It’s a site where he makes available signed copies of new releases for fans who can’t make it to events where their favorite author appears in person. He also blogs for Suvudu.com, the Random House speculative fiction blog and runs websites for authors like Terry Brooks and Naomi Novik. What you may not know is that Shawn suffers from Hodgkins lymphoma. Diagnosed in 2011 and without health insurance, his treatment has left him with thousands in medical bills. Faced with filing bankruptcy, Shawn sought another way out. A way he could make it through without dealing with the 10 year nightmare a filing would bring. Then his friend Terry Brooks offered him a short story Shawn could sell to help alleviate those bills and an idea came to his head. What if he did an anthology from some of the many author friends he’d made over the past few years from both Suvudu, The Signed Page and his other activities? Unfettered was born, and soon Brooks had been joined by an incredible list of names. 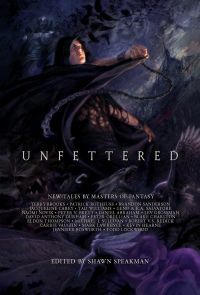 Well, now preorders for Unfettered are finally available. You can help support Shawn and get some incredible, one of a kind stories, in the process. This includes a Robert Jordan/Brandon Sanderson Wheel Of Time story. None of these have ever been available before. 23 authors offering stories from some legendary franchises. Gathered together in a special edition ebook and print, including leatherbound signed collector’s editions signed by all of the authors. The books will be available in early 2013. But you can order now. Paper print prices range from $35 to $150 for the signed editions. Ebooks will be $12.99. Authors contributing to Unfettered include: Terry Brooks, Patrick Rothfuss, Robert Jordan & Brandon Sanderson, Jacqueline Carey, Tad Williams, Geno & R.A. Salvatore, Naomi Novik, Peter V. Brett, Daniel Abraham, Lev Grossman, David Anthony Durham, Peter Orullian, Blake Charlton, Eldon Thompson, Michael J. Sullivan, Robert V.S. Redick, Carrie Vaughn, Mark Lawrence, Kevin Hearne, Jennifer Bosworth, Todd Lockwood, and Shawn Speakman!